Four years ago, Sol Savchuk reset her life. Moving to the U.S. from Ukraine, Savchuk fled her war-torn homeland alone to seek asylum. “It wasn’t safe for me,” Savchuk said, recalling the violence that led to the 2014 Ukraine Revolution. She helped some of the injured as a medical volunteer. But coming to a foreign country forced her to face other fights — ones that threatened her goal of becoming a doctor. 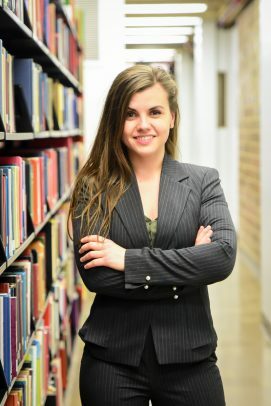 “As an asylum-seeker, I was not eligible for any federal aid,” said Savchuk, who longed to resume her undergraduate studies in the U.S. In those years, she was promoted in the restaurant where she worked, making her way from barista to service manager. Still, she recalls being discouraged from pursuing her dreams. And not knowing whether she’d overcome those adversities sometimes took its toll. “Those two years of being out of school and not being sure if I’d ever get back on my feet were the most difficult ones,” she said. Savchuk did get back on her feet. In 2016, she enrolled as an Honors College student at UIC while working almost full time. As a student, she majored in neuroscience and assumed leadership roles in organizations like TEDxUIC and the Society for Future Physicians. She also worked in research labs. One at UIC explored psychology-related topics of cognition and language. Another at Northwestern University focused on brain cancer and glioblastoma. Her leadership and merits have even helped her win awards and scholarships, including Honors College tuition waivers and the Mark A. Wyatt Memorial Scholarship, which goes to outstanding pre-med students in the sciences. “I am so grateful for all of the support,” said Savchuk, adding that she’s learned to stay motivated and determined. As Savchuk waits to graduate this December, she’s completing interviews for medical schools.